You may have even heard of the Boiler Scrappage Scheme which promised to help contribute towards the cost of replacing an old band G type with a modern band A condensing type. But why bother? 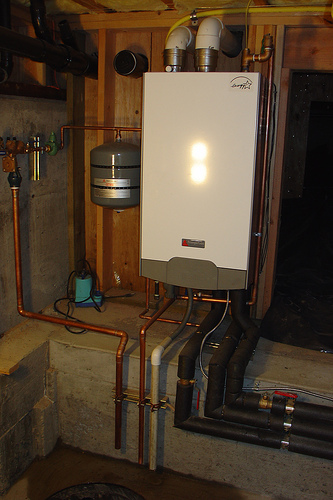 What good does a little bit of extra boiler efficiency give you? This article will explain what the benefits are to having a more modern boiler and how it can help to save you money in the long term. First of all it is important to note that this article focuses on gas fuelled boilers only, it doesn’t mean the content doesn’t apply at all to other boiler types, but that the main focus of this article is about gas boilers, which are the predominant boiler in the UK market and in the majority of properties today. Boilers of all ages, ancient and modern, are graded in terms of efficiency which are given as a percentage. For example, a band G Boiler (the lowest type of efficient boiler) is rated at below 70% efficiency, whilst a band A boiler is rated at 90% and above efficiency. What does this mean in practical terms? Well it is very simple. If you think of the fuel for your boiler as being provided in ‘units’ and each unit gets burned inside the boiler to generate your heating for your house and your hot water. In any burning process there are waste by-products. In a wood fire you get ash and smoke, in a gas boiler you get a certain amount of waste gas that is expelled via the flue. The efficiency rating is how much of that unit of fuel actually gets used to provide heat and how much is expelled as waste gas. So in a boiler of 70% efficiency 70% of the unit of gas gets used as fuel, the rest is wasted outside. In a modern condensing gas boiler of 90% efficiency, 90% of the unit of fuel is used, and only 10% is lost. It might not sound a lot but that efficiency change can save you a large amount of fuel and thus cut your utility bills. Changing boilers can easily save you a £100 or more a year and modern boilers generally come with other cost saving devices such as Thermostatic Radiator Valves and efficient Thermostats, which can also help to ensure the rooms in your house are properly heated according to purpose. For example, you might have a room that you only use for storage, so why would you want to heat it to the same temperature as your lounge? A Thermostatic Radiator Valve can help to reduce the level of heating within the room by managing the radiator temperature. Even just doing this on one radiator contributes to overall saving of fuel and, therefore, money. The cost of replacing a boiler can be expensive and you should always consult professional companies who are on the Gas Safe register before you do decide to replace a boiler. However, the long term benefits and savings should well outweigh the costs. Unfortunately, the scheme itself has been scrapped (excuse the pun) from Friday 26th March 2010. At the time of writing the recently elected government has no intentions of extending it. Kudos to Simon for mentioning Gas Safe, many people are still unaware that it has superseded the CORGI standard as the new regulatory body for gas work. It was a great idea and is reported to have been quite successful. It was a shame that more promotion marketing of the scheme was not doing beforehand so more people were aware of it. In the current financial situation is it likely we will see it return ??? « Battling the Breeze – Can Draught Proofing Save You Money?